Vishnu, the protector of the universe and one of the Hindu Trinity, is said to take birth in this mortal world whenever it is overburdened with sinners, who by their wicked actions upset the equilibrium of the earth. One such incarnation is his birth as the son of king Vasudeva and his wife Devaki. He was then given the name of Sri Krishna, and his story is recorded in the famous work of the Hindus known as Bhagavatam. The birthday of this marvelous child is celebrated as a festive and sacred day on the eighth day of the dark fortnight in the month of Shravana called Aadi in Tamil which corresponds to the English months of August-September. You can find last year's celebration here. 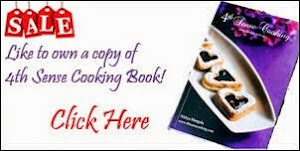 In a bowl, mix maida, semolina, baking powder and salt. Add the condensed milk and water to it and make a batter. Set this aside for 15 mins. Meanwhile mix sugar and water in a pan and allow it to boil till it comes to one sting consistency. Now take just enough oil in a pan, say about 1 inch from the bottom of the pan and once it is hot enough pour in half ladle of batter in the center and allow it to fry for just a min. Flip it and let it roast on the other side too. Its time to remove them when the sides are little roasted and the center turns light golden brown. Once removed from oil, just dip in the malpua into the sugar syrup for a min and remove them. Arrange them on a plate and garnish with chopped pistachios. Nithya, it's a beautiful post.That malpua is beckoning me! I am already thinking of an event where I can make them! cute pictures of u and ur sis. 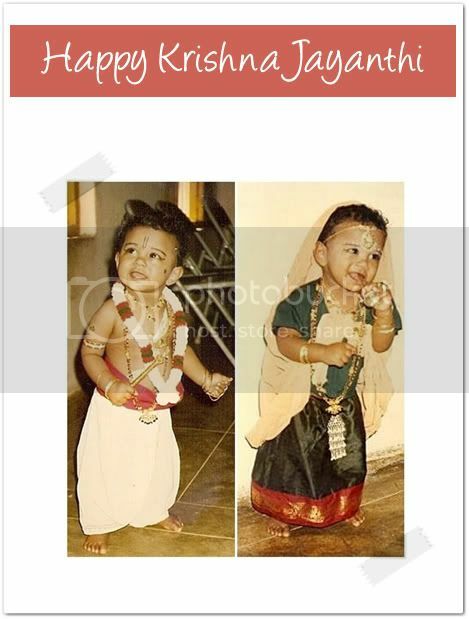 Cute pics Nithi..Loved the malpua so much. Sounds easy to make will try it !!! I love that krishna pratima made out of dough?! And let me tell you I never ever can make such perfectly round malpua! Nithya - everything looks fabulous! I'm sure Krishna was a very satisfied birthday boy yesterday! Especially after those malpuas! They look divine! 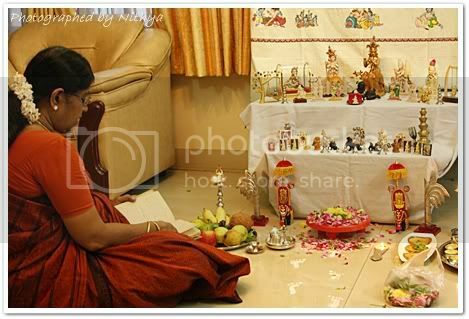 Nithya, you look sooo cute.. beautiful and wonderful post..
You look so cute as Krishna..loved the decorations..reminds me of the celebrations at my place! 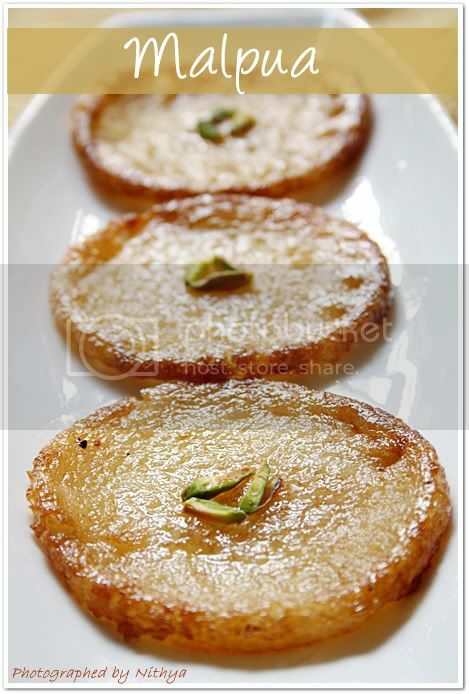 !Malpua looks delectable,the close-up pic actually made me drool..lovely!! 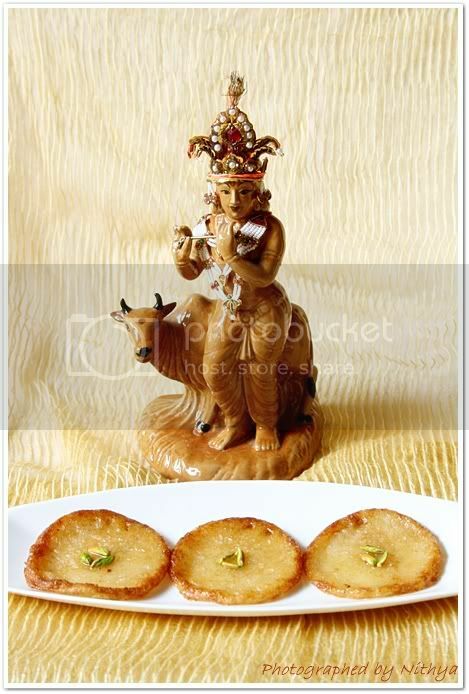 Acho so cute krishna....ur sis looks pretty as radha too :) Havent heard of this sweet named malpua...looks so yum! Those are really cute pics of yours and I loved the pic with Krishna's reflection. I see your pinwheel cookies in neivedyam. Is this for the Modern Krishna. Hope you had a good time. Happy Janmashtami. 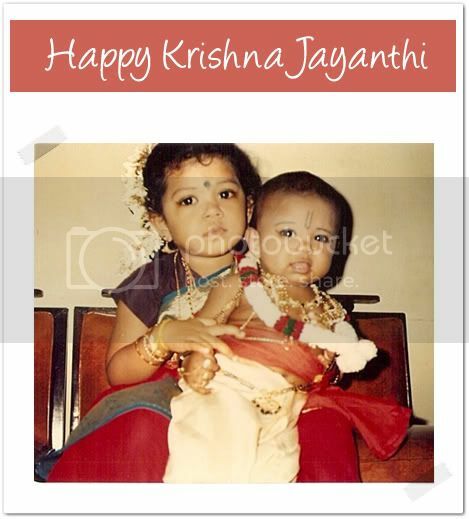 Happy Krishna Jayanthi to you & your family!! Very cute pics of your dear.. Happy gokulashtami.. Malpua looks so yuumy. Cute pictures Nithya, brings me loads of beautiful memories, coz i do have somewat the similar pictures of mine and my sister..Malpua looks irresistible..Love the krishna with murukku dough, kudos to ur mom..
Wow! 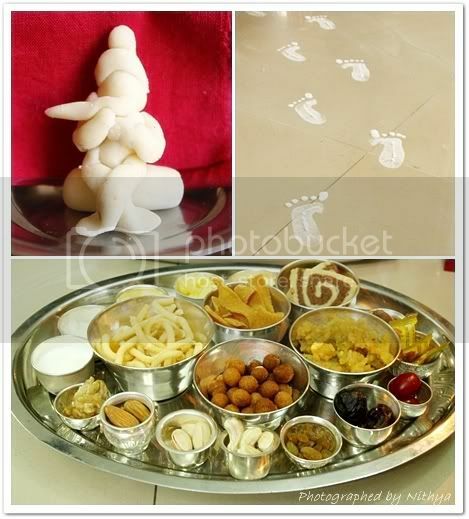 Awesome post, Nithya :-) I loved the Krishma made of murukku dough. And, the malpuas are tooo tempting! You were a cute baby Nithi :-)Now I know where you got the artistic talent from..your mom..The murukku dough Krishna looks wonderful..so is your pics :-)Happy Janmashtami ! What beautiful memories dear. Love those old pics. Love that brass idol of bal krishna, lovely. 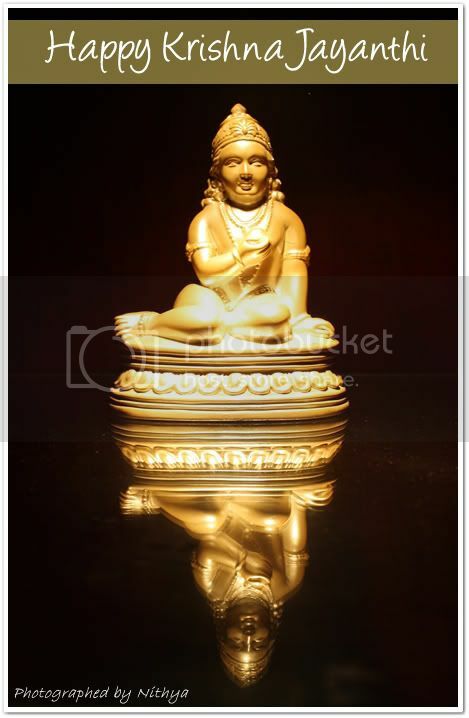 I need to buy a small idol of bal krishna, I always wanted it. Cute pics Nitya...Malpua looks yum! The Malpua looks so tempting ....Loved ur previous post too !! I loved the Krishna with murukku dough. Lovely pictures and delicious Malpua. The M.dough Krishna looks amazing. Nithya..! Now we know.. ! its all the genes!! Just loved that Krishna made of dough by your mom!!!... perfect! Loved the recipe.. looks simple too.. will try! Lovely post,you looks so so cute :) :) Thanks for sharing those! Malpua is very new to me,perfect rounds too! You look so cute, N. The malpuas look soft and delicious. hey nithi check my site.. have posted the same recipe.. Again took frm ur site and as usual never failing recipe with an awesome taste.. thanks for making my parents happy!!!! Wow... so rich and awesome malpuas! !